This is part of a mini-series on our competitively priced budget label Fabulous under the banner of Jazz Legends, presenting some of great and influential names of jazz, with recordings drawn from the classic era of the genre’s development between 1920 and 1950. Roy Eldridge was one of the most important jazz trumpeters of his era, effectively superseding Louis Armstrong as the most noted “hot jazz” trumpeter of the swing and early bebop eras, during which he had a profound influence on the sound and style of Fletcher Henderson’s orchestra and the early Gene Krupa combos. 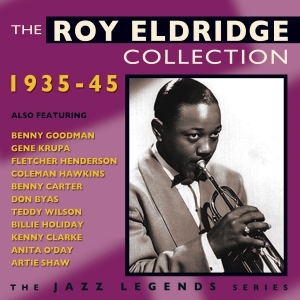 This great-value 24-track collection dips into his recording career through a highly active decade which spanned the swing era and the formative early years of bebop, and showcases his work both with his own orchestras and under other leaders, including recordings with the great Billie Holiday as well as many of his most illustrious contemporaries. It’s an extremely entertaining journey through a dynamic and exciting era of jazz. 10 Wabash Stomp Roy Eldridge & His Orch. 11 Florida Stomp Roy Eldridge & His Orch. 12 Where The Lazy River Goes By Roy Eldridge & His Orch. 13 After You've Gone Roy Eldridge & His Orch. 22 The Gasser Roy Eldridge & His Orch. 23 Minor Jive Roy Eldridge & His Orch.